A surprise, this big church in its wide unfenced graveyard, in the centre of a large village. 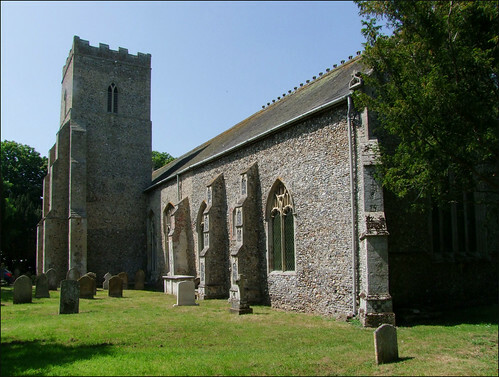 It has all the greater presence here in high Suffolk, surrounded as it is by villages with smaller churches. Around these parts, only Eye is more imposing. What a pity then, that unlike most of its neighbours it is kept locked. So I wrote ten years ago, and coming back on a stunning, hot day in early June 2010 I found that little had changed. I had cycled down from Diss, then on through Eye and out to quiet Redlingfield. After the peace of that intensely rural spot, I had cut back through busy Occold and then on into Thorndon. It is still a substantial village set along its long street, home to the local health authority's Kerrison conference centre, the nearby pub playing host to the village shop. The strange south tower of All Saints still imposes, and the church is still ordinarily kept locked, I am afraid, although there is a keyholder notice now. The south tower is massive, forming an entrance, and the nave stretched either side of it beyond creates the impression of a gatehouse to a baronial castle, possibly in the Highlands of Scotland. The tower is about a century later than the 13th century nave against which it stands. In the south wall behind a later tombchest is a curious tomb alcove. It was probably the last resting place of Nicholas Bockland, the donor of the chancel. Why was the tower built to the south and not to the west? Suffolk has some thirty-odd south towers, but they are mainly in the south-east of the county. It may have been that the ground was too soft to the west, or that there wasn't room then, although the graveyard stretches widely to the west today. Perhaps they simply thought it looked better that way. I was rather pleased and intrigued that, on this Friday morning, a car was parked immediately outside the entrance, and the church itself was open. I stepped down into the porch, and then for the first time, through the double doors into the church itself. A cheerful lady was inside doing the flowers, and was very happy for me to come in and have a look around. She even offered to make me a cold drink, not least because she was proud of the church's recent reordering of the west end, with the pleasing woodwork of the kitchen and meeting room subtly integrated against the western wall of the nave. She also told me that the church was now open one morning a week so that local people could come in for as cup of tea and a chat, which seemed a step in the right direction. The interior of All Saints is almost entirely the work of Richard Phipson, in 1870. This was one of his last jobs before his appointment as Diocesan architect, and must have been a pretty good testimony. As usual with him, it is mostly safe and sensible, if unexciting. His crisp use of encaustic tiles in the sanctuary prefigures those of his masterpiece, Ipswich St Mary le Tower. The reredos is also his design; Mortlock tells us that it was paid for by the Poet Laureate Robert Bridges, and carved in Belgium. Phipson's, too, are the roofs, and most of the furnishings. There are a few medieval survivals. The traditional East Anglian 15th century font is a good one, though largely recut. The lions around the stem appear to be stalking the pendant angels below the bowl. The scattering of medieval glass in the north chancel is intriguing. Set among it is a roundel of 16th century Flemish glass depicting the stripping of Christ. The two thieves who will be crucified with him sit and look on. Another piece of continental glass depicts St Peter. There is also a roundel in the continental style depicting the crucifixion, but this is actually modern. I think it probably dates from the 1920s, suggesting a date for the resetting of this glass, and may be the work of the Norwich-based King workshop. It appears to be signed at the foot of the cross. Perhaps the most interesting thing here is the brass inscription set in the north wall. It comes from the redundant church at Rishangles, a couple of miles away. That was was sold off for domestic use, and is now being refurbished after a period of dereliction. But the brass was moved here. It is to Richard Grimeston, and dated 1599. Looking back at his life over that theologically eventful century, it reords that by twice two kings and queens his life was grac't, but one religion held from first to last. This intrigued me, deep as I was into Hilary Mantell's Wolf Hall: is it a proud boast of his Protestant pedigree? Or a quiet hint that he remained loyal to the Catholic Church through its darkest days?